When those who describe themselves as anti-fascists (Antifa) adopt violence as a tactic, it becomes difficult to see how they are any better than those they label as fascists. 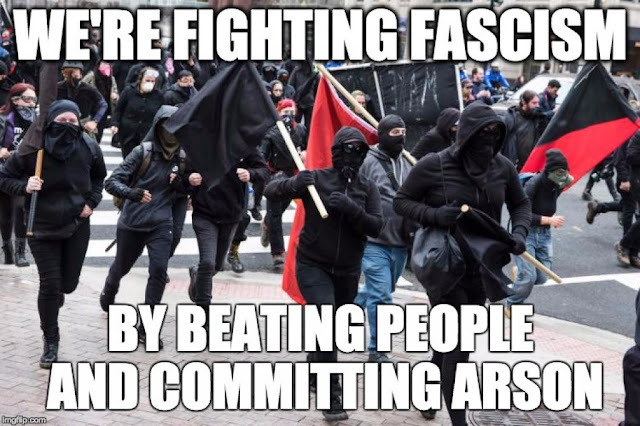 I suppose the anti-fascists would claim that their violence is justified. They'd argue that it serves a greater good or that the ends justify the means. The thing is, those they consider fascists would almost certainly claim the same things. Violence is not an acceptable way to bring about whatever social justice agenda one might have. It is not an acceptable way to oppose the expression of ideas one finds objectionable. It accomplishes little more than guaranteeing that more violence will follow, and it signals that one has surrendered whatever moral high ground one might have held.